Well day 2 started off as it usually does. There's no better wake up call then the clink and clank of the teeth of a bull dozer grooming the track at 6am in the morning. Then of course the announcer Paul T. Petersen comes over the pa system as say the usual speech, "Good Morning riders, welcome to Royal Mountain. It's going to be another hot one today, make sure to drink lots of fluids etc. Riders meeting over the pa at 8:15am. Remember if you want to listen to the broadcast, you can do so by tuning into station 88.1FM." Shortly before getting started racing a moment of silence was held for a long time rider who had past away. 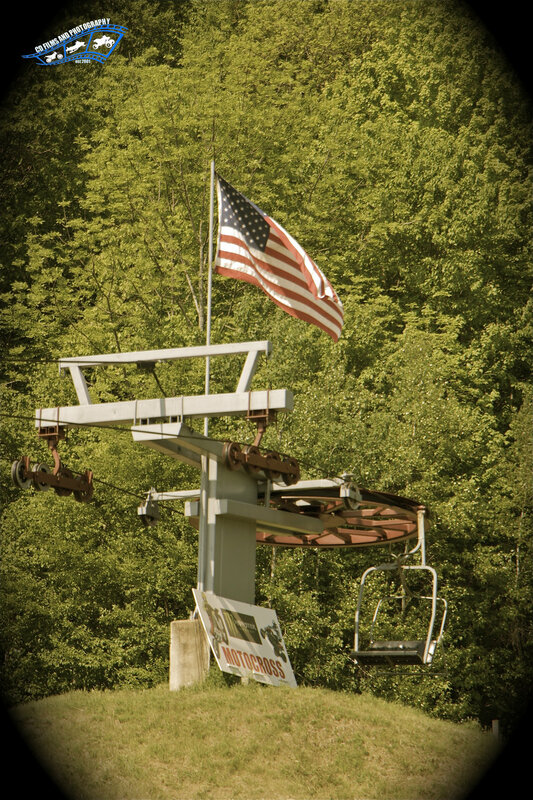 Greg Stempel was a long time traveler who made many trips to Royal Mountain over the years and brought 3 generations of riders into racing motocross. There was also a quick tribute done to honor those who came before us and those currently fighting for our freedoms on the Independence day/ 4th of July weekend. Racing began shortly after, "Riders on the line, Start your Engines!" said Paul, the announcer. The quads were up first. It was only fitting since they went last on Saturday. Quads out the gate and they're off! Up the hill they go and it's Alex Ritton up the hill for the schoolboy however, lurking behind was Mason St.John Lemery who made sure work getting to the helm of the field in now time at all! 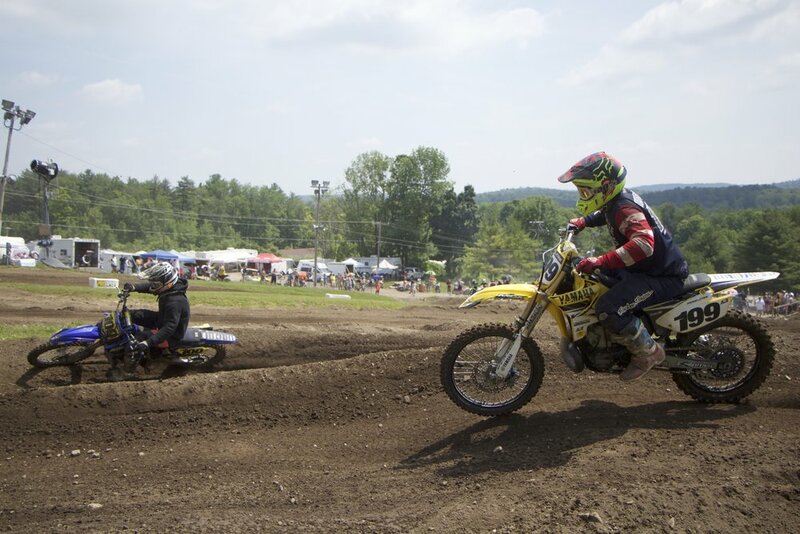 Lemery would set the pace of the class and took the win with Ritton taken second and local rider Tyler Covey rounding out the top five in the class. On to the Quad Amateur and Quad experts. Riders off of the gate, the experts first... oh and they're banging bars... it's Talbot, Briggs, Birdsall, Yarder and Hoffman... and they're side by side... Yarder would make it to the lead with Talbot to follow toe. Duking it out lap after lap, contact, tires touching .... and it's Talbot having to give... he would back out of the gas and off the quad he goes.. quickly returning to his quad. Meanwhile further back in the field it's New Berlin's Wyatt Hoffman battling hard with Ryan Fraiser and Jeremiah Birdsall. Talk about moving people around, Hoffman on many occasion sticking that front tire side by side the competition to get the position. In the end it would be Yarder to pick up the win with Talbot nipping at the heels for 2nd. 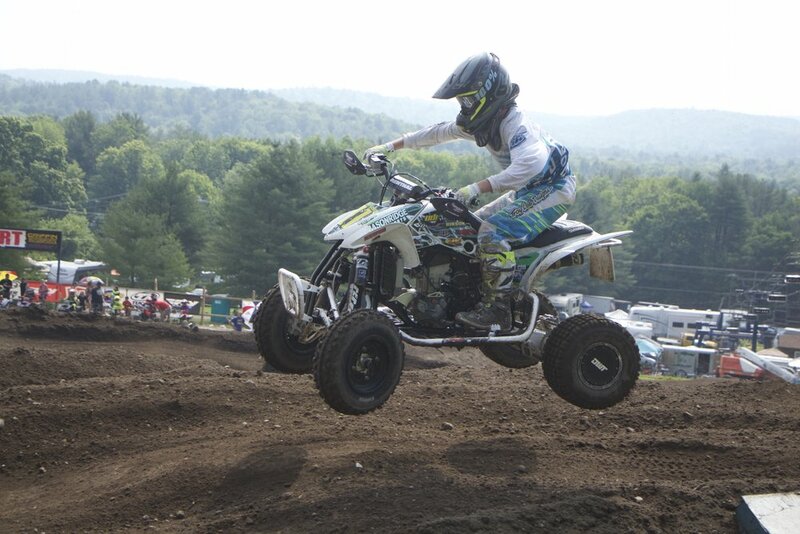 Supercross regular Peter Miller would take the top spot in the Quad Amateur class. A hard charging 2nd place finish would go to Scott Salls with Joe Hanson and Brandon Avery of Avery's Auto service duking it out for the final spot in the class. Open Mini class was certainly a bar banger thats for sure. Riders Evan Miller and Issac Lawyer looked to double down after having a successful day on Saturday. Miller would find himself doing battle having some work to keep him busy for both motos. This time he had Dominic Grenga, and the "Ravena Rocket" Daniel Barry to contend with. Lawyer would get out in front having great battles with Miller going up the mountain, but it's Grenga to the front making it three wide, Grenga to the lead. Barry now putting the pressure on Lawyer and the rest of the field but does Barry and the other riders have enough time? It would be Lawyer with a hard fought fight for the 1st place position and Grenga with Evan Miller to round out the top 3. Moving on to another notable class. They say the open novice class is one of the most exciting classes to watch. Everyone is hyped up. Soo with Erin Demers getting the holesot up the hill, he knows that he has a whole swarm of "killer bees" on his back fender. Kramer is hungry, he can feel a good run in his sights. Kramer would be seen going on the edge, going inside and outside trying to make any line work to his advantage but no he couldn't quiet make it work. Kramer would have some difficulty getting caught up with some other riders duking it out with the #122 Kawasaki of Zach Lewendowski and at one point making it 3 wide in to the turn going to the horse shoe after the double double behind the ski lift. In the end the #77 machine of Jacob Stevens would hit the switch and blow past everyone taking the lead. Shute, Joey Argus #132 and Erin Demers would charge their way to keep up with the 77 but they were no match for that man because Stevens had already checked out. So in the open notice class it would be Stevens, Shute, Argus, Demers, Lewendowski and Cody Kramer to round out the rest of the class. Moving on, Bike Amateurs and Experts on the track now.. Casey Battisti and Frank "the Tank" Hempstead would duke it out. Back and fourth both riders would know each other were there. They'd look over and see each other, side by side they'd go, one pulling away from the other. The one pulling away would be Frank the Tank. Battisti would slow down to catch his breath for a moment then like a freight train he comes a couple of Amateurs closing the gap. It's Mark Molesky #100 and Nick Debernardis on the #842. Molesky shot out of a canon, ka boom... He is gone and checking out. Debernardis would have to contend with Parker Chase, Jody Hamilton and Mat Mauro. So to finish up the Experts, it's Hempstead and Battisti for 2nd. For the Amateurs, 1. Mark Molesky, 2. Nick Debernardis 3. Jody Hamilton, 4. Parker Chase and Mat Mauro to round out the top 5. Lastly, the wildest mini moto of the day! 51cc class on the line and this time it's Kaiden Forrester on the 210 out of the gate first. 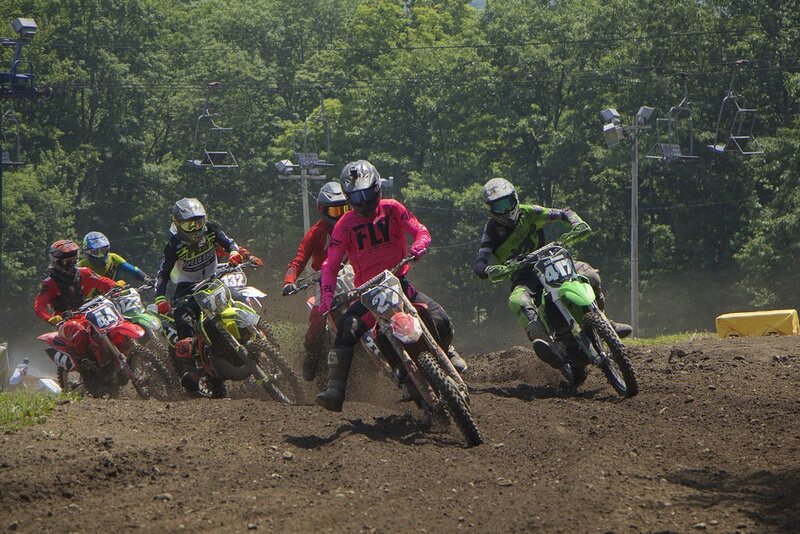 Leading the way in the 50 class.. But not fair behind is the 433 of "Moto" Maxx Miller. Both Forresters would duke it out for position; in the end it would be Miller to take the lead. Moving through the field, Miller had some company, rider 428 Blake Patrick and a fast young lil guy Kaden McAffrey would battle it out. In the end Miller would take 1st place in the open 51cc class and 2nd in the peewee sr. class. Blake Patrick would do the opposite, He would take the win in the Peewee Sr class and 2nd in the open 51cc class. Kaden McAffrey would take a solid 3rd place finish in the open class and a top 5 finish in the 51cc class. If you'd like more information on racing you missed, follow the link below to see there article from our local newspaper the Leaderhearld. Older PostMonster Motocross successful during heat wave part 1!